Simon Spalding will be live tonight onstage at City Stage! At press time here is what we found for the week ahead. Always call the venue to confirm. The Brown Pelican, 411 Broad St., (252) 631-5008 Open Mic is hosted by Brian Mac. Sign up starts at 7 pm Music starts at 8 pm. Pack up the gear bag and come jam!!! BrÜtopia, 1201 Highway 70 E, (252) 631-5142 welcomes Caffeinated Soul Boogie will be sharing songs from 7-10 pm. The Garage 1209 Highway 70 E, is hosting their soft opening. 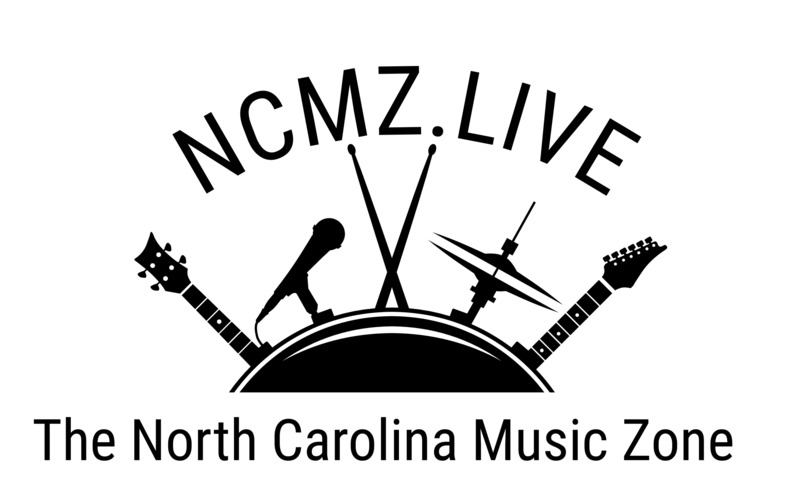 They will be hosting live music with Tommy Duzan, Sr. live starting at 7 pm. 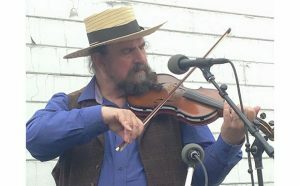 The Brown Pelican, 411 Broad St., (252) 631-5008 offers the music of Rick Huff with Mollie Hunter Belet who will be jamming this Friday with FREE music offered 7-10 pm. Blackbeard’s Triple Play Restaurant 415 S Front St., (252) 635-0322 offers live music on the Friday 7:30 pm until 11 pm. Free music to welcome your weekend! BrÜtopia, 1201 Highway 70 E, New Bern, NC. (252) 631-5142. Free Music 7-10 pm featuring the songs offered by Daryl Lucas. Come out and support local music, local food, and cold local brew. The Brown Pelican, 411 Broad St., (252) 631-5008 welcome Buck Loy and Bruce Lynch Live! Free Music! 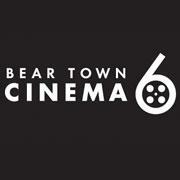 8-11 pm. Blackbeard’s Triple Play Restaurant 415 S Front St., (252) 635-0322 Rural Route Romance will rock the deck with the country and party grooves you dig. Free music 7:30-11 pm. 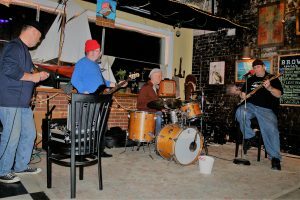 The Brown Pelican, 411 Broad St., (252) 631-5008 Welcomes the week with a blues Jam at the Dirty Bird. All are welcome. Jam goes down from 7-9 pm hosted by Big Jim Kohler Band. BrÜtopia 1201 Highway 70 E (252) 631-5142 30 Seconds Rocks 6:30 pm. Blackbeard’s Triple Play Restaurant 415 S Front St., (252) 635-0322 30 Seconds Rocks Music Bingo 9 pm with DJ! The Brown Pelican, 411 Broad St., (252) 631-5008 TRIVIA NIGHT Fun starts at 7 pm. Beer Army Burger Company 313 Pollock St., (252) 288-5814. TRIVIA NIGHT starts at 7 pm. 23rd: Natural History Day, 10:00 a.m. – 2:00 p.m. in the Tryon Palace Gardens. 23rd: African American Heritage Tour, 2:00 p.m. at the Tryon Palace Waystation. 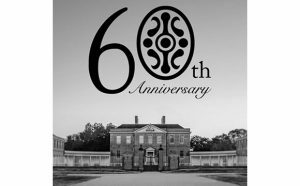 Behind the Scenes: Conservation Lab, 2:00 p.m. at the Tryon Palace Waystation. Call 252-639-3500. 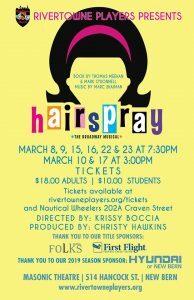 Hairspray, shows will be live on stage the next two weekend with showtimes Fri – Sat: 7:30 p.m. and Sun: 3:00 p.m. at the Masonic Theatre. Presented by RiverTowne Players. Call 252-633-3318. Offering Alladin – JR, Fri – Sat: 7:30 p.m.; Sun: 2:00 p.m. at the New Bern Civic Theatre. Call 252-633-0567. Neuse River Bridge Run at Union Point Park. Arbor Day Celebration, 11:00 a.m. – 12:30 p.m. at Union Point Park. Call 252-639-2901. 4th Annual Craven Works Job Fair, 1:00 p.m. – 6:00 p.m. at Temple Church. Presented by Craven 100 Alliance and Craven County Department of Economic Development. Call 252-633-5300. “The Wright Stuff” – The Eastern Carolina Aviation Heritage Foundation Annual Gala, 5:30 p.m. at the Havelock Tourist and Event Center. Call 252-444-4348. Battlefield Adventure Day, 11:30 a.m. – 4:00 p.m. at the New Bern Battlefield Park. Presented by the New Bern Historical Society. Call 252-638-8558. 8th Annual Reach for the Stars Gala, 6:00 p.m. – 11:30 p.m. at the Flame Catering and Banquet Center. Presented by St. Paul Catholic School. 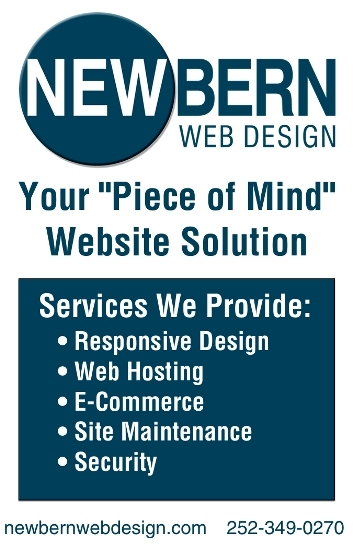 Call 252-633-0100. Kindergarten: Ready, Set, Go Information Session, 6:00 p.m. at the First United Methodist Church of Havelock, 324 Miller Blvd. Call 252-672-5921. 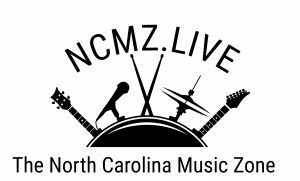 Also, be sure to visit like the New Bern Music Calendar Facebook page created by Bob and Joanne Friedman. Take flight with ParaFlight (703) 963-7389. Do you prefer ballroom dancing? Visit the Rivertowne Ballroom (252) 637-2003. Take advantage of over 20 parks and recreation facilities maintained by New Bern Parks & Recreation (252) 639-2901. Introduce your dog(s) to new friends or just let them run around at the Down East Dog Park at Glenburnie Park, please know that you need to register first and receive the gate code before you can enter (252) 639-2901. Craven County Recreation & Parks (252) 636-6606. Visit the New Bern-Craven County Library as they have a lot of fun programs, events, and resources! 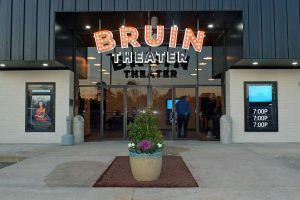 They offer children’s programs, computer usage, and technology workshops, book clubs, writer’s workshops, open mic night, live music, children’s theater, movie screenings, and rentals, meeting rooms, historical and genealogy research, and much more! (252) 638-7800. Take a walk in the woods in the Croatian National Forest. The forest’s habitat has carnivorous plants like the Venus flytrap, pitcher plant, sun-dew, butterwort, bladderwort among other exotic plants. The Croatian spans approximately 160,000 acres and is located in New Bern’s backyard. It’s a sanctuary for black bear, deer, wild turkey, quail, coyote, bald eagle, beaver, bobcat, porcupine, American alligator, red-tailed hawk, and other wildlife you may see. For maps and more information, talk to the people at the Croatian National Forest’s Ranger’s Station on Hwy 70 E (252) 638-5628. Listen to New Bern and Beyond’s Podcast for an in-depth review of the great happenings in and around town!